Just four months ago, Apple came within a stone's throw of the biggest quarterly profit in corporate history -- now it has a profit problem. Pressure on profits is the reason Apple (AAPL) stock has plummeted by 40% since September, why CEO Tim Cook is under fire, and why investors are freaking out about the lack of hot new products. For Apple, the number to watch is the gross profit margin -- how much it keeps of every sale after accounting just for the costs of each product. Lower price points hurt the gross profit margin, as would higher supply costs. In the latest quarter, the gross profit margin fell to 37.5%, a whopping 10 points lower than a year ago. The trend shows no signs of letting up. Apple said its gross margin would fall again to somewhere between 36% and 37% this quarter, which is far worse than Wall Street analysts had expected. Those analysts think that overall profits will drop 14% in the quarter. For those used to Apple's invincibility, the problem comes as a shock. But there are clear reasons behind Apple's profit problems. 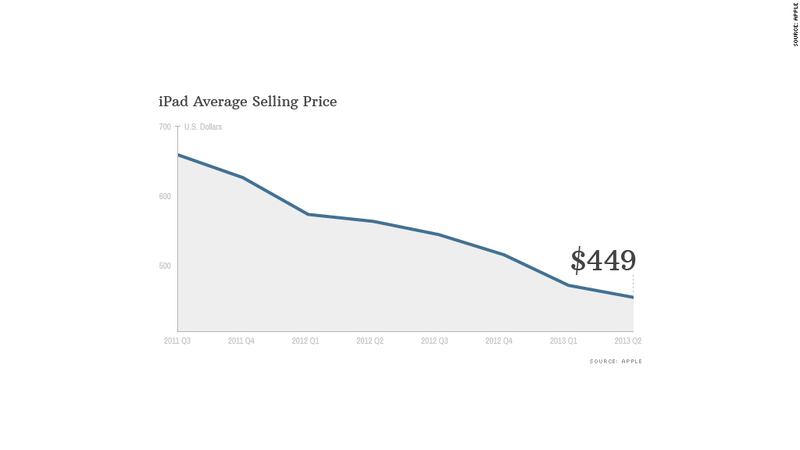 Cheaper and older products: The average selling price for an iPhone fell by $28 during the past three months. The reason? The most popular phones are still the iPhone 4S, which launched in 2011, and the iPhone 4, which came out in 2010. Many wireless carriers are offering these older phones for free or for $100 less than the new iPhone 5. Apple also said Tuesday that it sold more iPad minis last quarter than it had planned. The popularity of the iPad mini has dragged down the iPad's average selling price to $449, a more than $200 drop from two years earlier. Profit margins on the mini are "significantly below the corporate average," Apple's CFO Peter Oppenheimer said on a conference call with analysts. More competition: Apple changed the smartphone market forever when the iPhone debuted in 2007, and it did the same to the tablet market with the 2010 launch of the iPad. But it is no longer far and away the best in the business. The Samsung Galaxy S4, which runs Google's (GOOG) Android operating system and is set to hit store shelves this week, has a handful of features that would make iPhone owners drool, including a significantly larger screen than Apple's smartphone. Apple is facing tablet pressure as well: Microsoft's (MSFT) Windows 8 has enabled a new generation of PC-tablet hybrids and Amazon's (AMZN) Kindle Fire has presented a cheap but impressive alternative to the iPad. Apple's sales continue to grow -- but not nearly at the same pace as a year or two ago, when Apple was doubling its sales every year. Tim Cook said Tuesday that Apple's slowing sales growth will continue to pressure gross margins in the near term. There is a way out of this predicament. Apple only needs to look back to its own situation a decade ago. Cook and Oppenheimer both noted Tuesday that Apple's margins fell after the iPod was released in 2001 -- iPods' profit margins were well below that of the Mac. But eventually, the iPod and music sales from iTunes made up half of Apple's overall revenue. Apple attracted a boatload of new customers when it came out with the iPod, getting them hooked on Apple. Then, in 2007, Apple launched the iPhone -- a much higher-margin device than the iPod -- and all those Apple fans rushed to get one. Apple may have a similar trick up its sleeve today. Lowering the price of the iPhone and iPad could potentially bring millions more customers into the iUniverse fold. Yet there's that crucial next step Apple needs to deliver on: a new, ultra-profitable product everyone will want. Until that happens, don't expect much to change.